The artist believes that humans must embrace imaginative evolvement in accordance with time. There is a need for positive spiritual evolution and enlightenment in all human beings in order for us to advance and live on this planet in harmony. The sculpture is inspired by an astral divine figure – Metatron, whose supreme stature inspires knowledge, ascension and spiritual growth. The white LED light acts as the supreme ray in a manner of a cosmic alchemy. Quintessence examines behaviours of a sculpture of the future that is reactive or interactive, whether it is through physical or mental triggers, data or through generative algorithm. An interactive system is designed for the spectators to activate the sculpture by sending the positive energy physically or digitally. The sculpture collects ‘light codes’ from audiences to be stored as a higher form of ‘intelligent energy’, which bring about personal evaluation, clarity and guidance to influence a collective unconscious of the planet and aid planetary evolution. The Quintessence is a research project of spreading and receiving the importance of "Unity" energy around the world. Which is the next phase of evolutionary goal for human being. 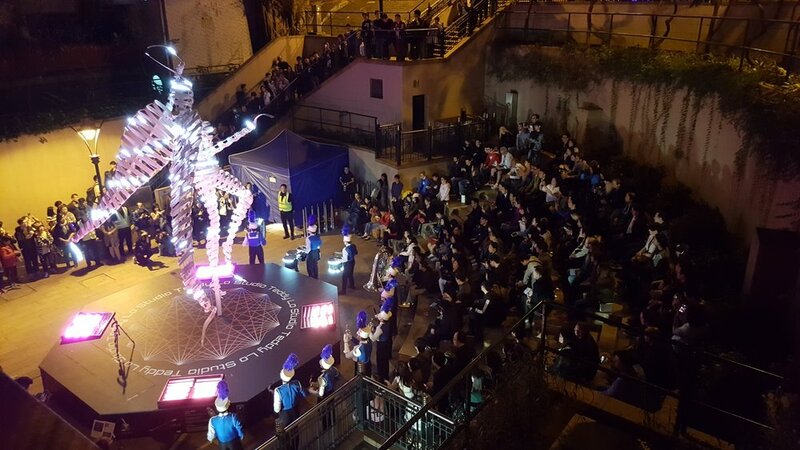 With all the turmoils, confusions and stress that Hong Kong has gone through in recent years, Quintessence has a strong presence with an important message to the city (and the world) and makes a dynamic, creative and technological expression for the first local light festival - Lumiere HK.